After a week in Waikiki, we flew to Kona on the Big Island and drove 2 hours across the island to Hilo. The islands are very different. I definitely felt more isolated and "out there" on the Big Island. 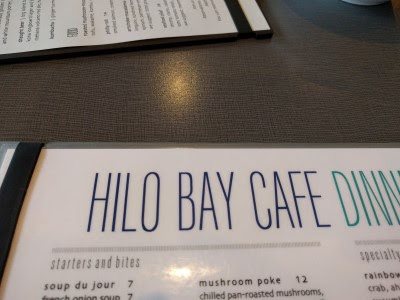 Our first meal in Hilo was at Hilo Bay Cafe, which was walking distance from our hotel. 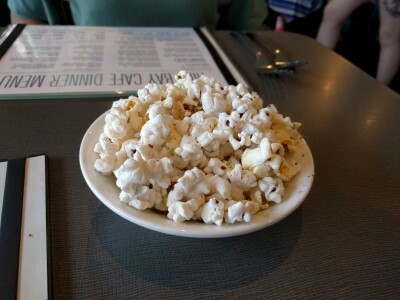 We had made reservations and were seated right away at our table with a bowl of popcorn awaiting us. The restaurant used to be in a strip mall by the Walmart but now it's next to Liliuokalani Park along the water. There is an elevator in back. 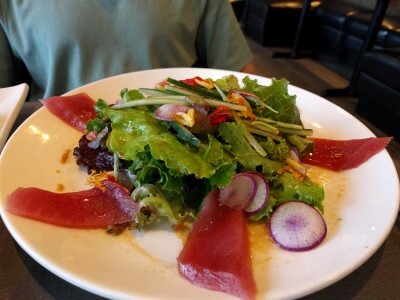 Sashimi Salad (fresh catch sashimi, mixed greens, shaved daikon radish, julienned cucumber, nasturtium petals, citrus-ponzu vinaigrette). I think the fresh catch was ahi. SP enjoyed this salad. 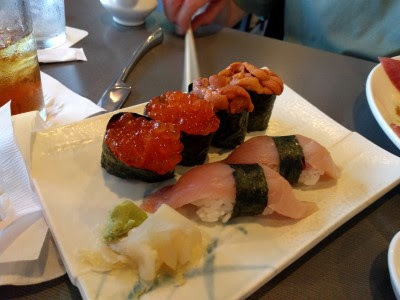 From the Nigiri & Sashimi part of the menu, SP enjoyed Ikura (salmon roe), Uni (sea urchin), and Hamachi (yellowtail). 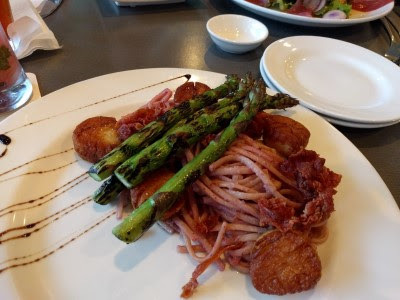 I chose the Scallop entree, served with pasta, asparagus, crispy prosciutto, a cranberry-macadamia sauce. It was good and very filling. 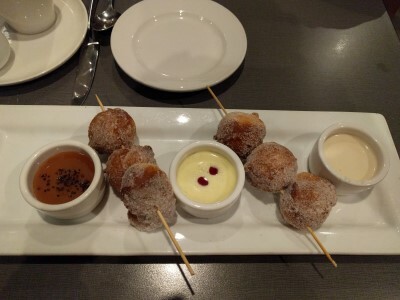 Of course it was not so filling that I couldn't help SP with a donut dessert: Dipping Donuts with a salted caramel sauce, creme anglaise and raspberry sauce, and a vanilla bean sauce (I think those were the 3 sauces when we were there). These were delicious and we both liked the middle dipping sauce best. 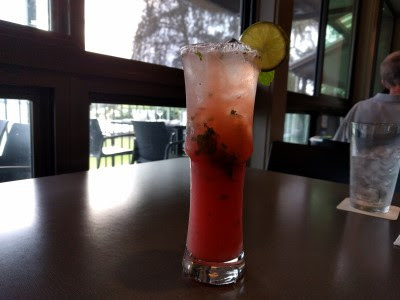 This was a great choice for our first night in Hilo. We were able to walk through a park to get to and from the restaurant. Our server was very friendly. The food was tasty. It was relaxing and casual inside. We'd go back.